Ultra High Definition (UHD) is the next progression in television image quality. This definition was made all the way back in 2007 by the controlling body SMTPE in the document SMPTE ST 2036-1. 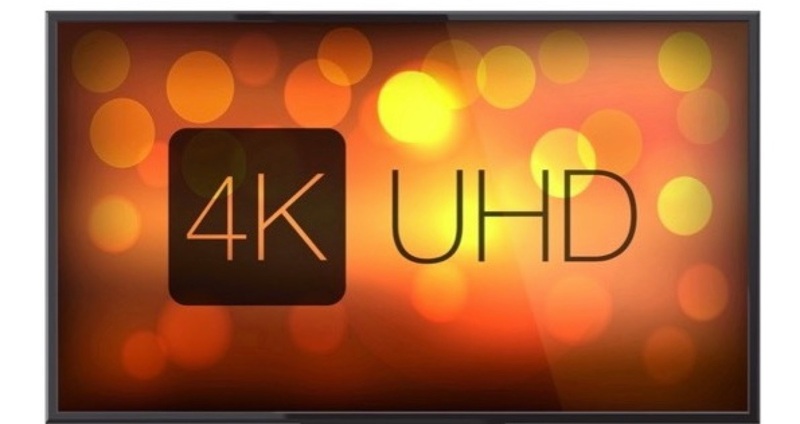 4K UHD is also defined within this document as UHDTV1. The High Definition standard more than doubled the size of the Standard Definition raster (720x576) to 1920x1080. 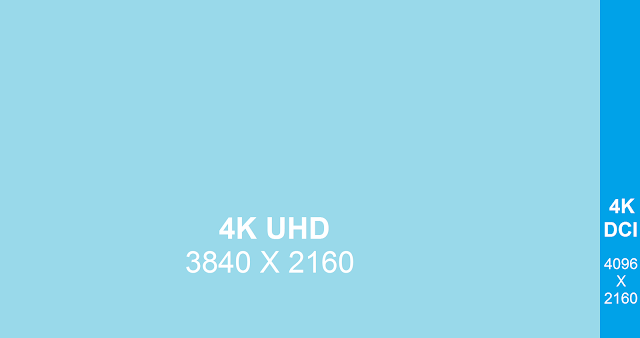 The 4K Ultra HD standard is literally twice the size of HD content. So that makes its lateral resolution = 3840 (1920x2) and its vertical = 2160 (1080 x 2) pixels. 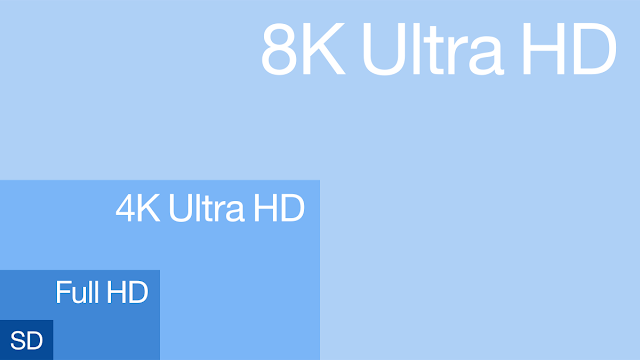 8K UHD is also defined in the same SMTPE document as 7680 × 4320 pixels and is known as UHDTV2. Both these standards maintain the 16x9 (1:77:1) viewing ratio. Is UHD the same as 4K used in Cinema? Cinematic releases use the DCI (Digital Cinema Initiatives) standard of 4K which is 4096 x 2160 pixels allowing for the image ratio to be 256∶135, better known as 1.90∶1. 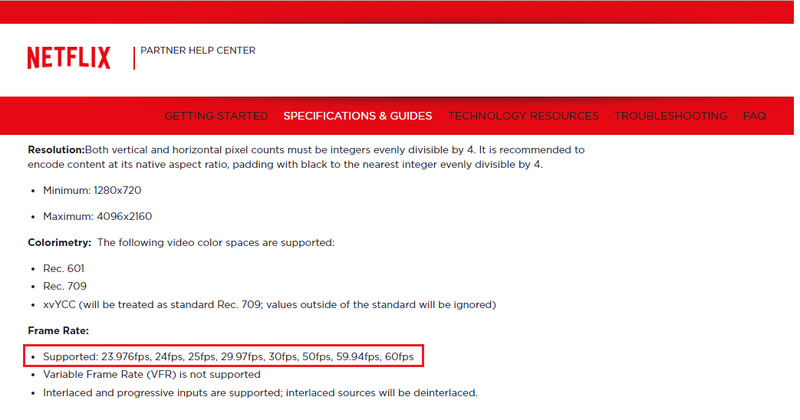 This means the image is 256 pixels wider. 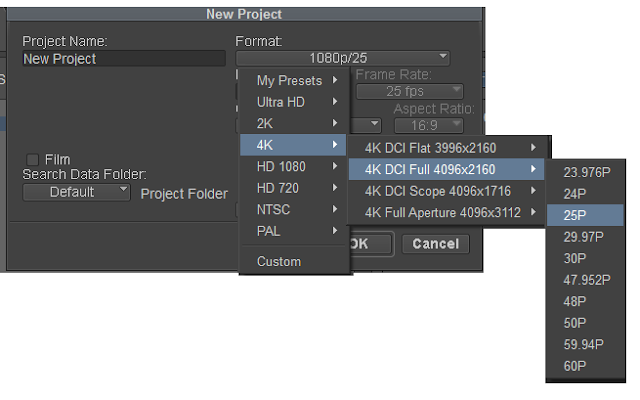 The 4K DCI Flat option is a cropped version to give a 1.85:1 ratio. This DCI 4K format would usually be used for motion pictures edits and releases. While UHD content can be shot with a High Dynamic Range it is not currently the norm for most productions. Working with HDR content firstly requires a camera that can capture an HDR image and to edit would usually require a HDR capable I/O card/unit and HDR Monitor. For a more detailed explanation see the SONY HDR Explained pdf. We'll leave HDR for now and look at this is more detail in a later post. HFR or High Frame Rate is supported in the acquisition of UHD material as defined by the SMTPE standard. These are commonly 25 / 30 / 50 / 60 / 100 and 120 fps. 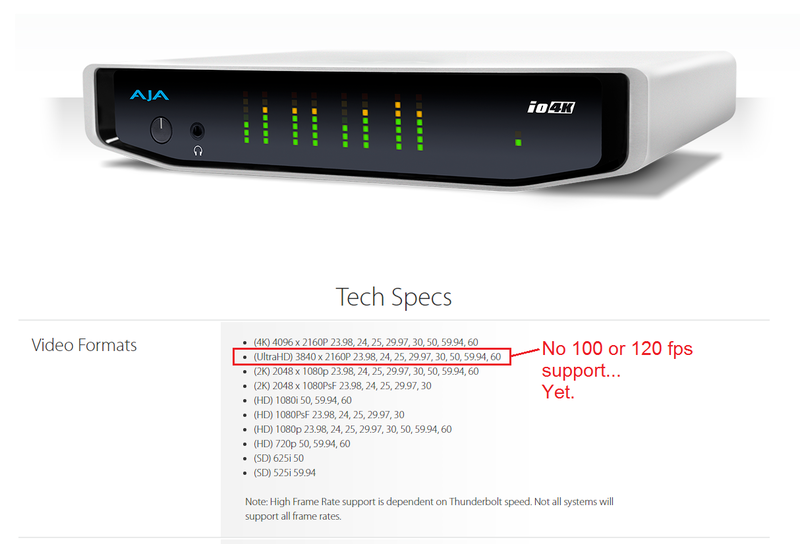 These higher 100 fps+ may not be supported for playback as the monitor or your video I/O hardware may not be able to handle it. Most delivery standards, however, will more than likely be 25 or 30 fps. 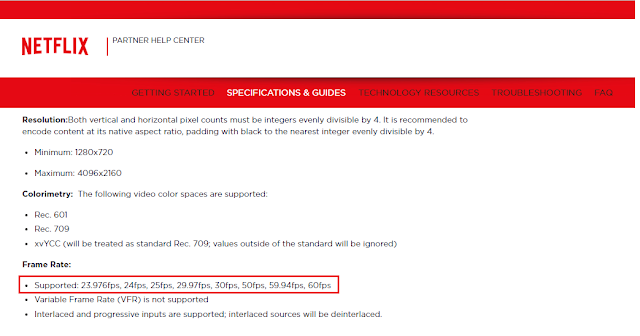 For example, the image below is the current Netflix Editorial standard which supports delivery of up to 60fps. 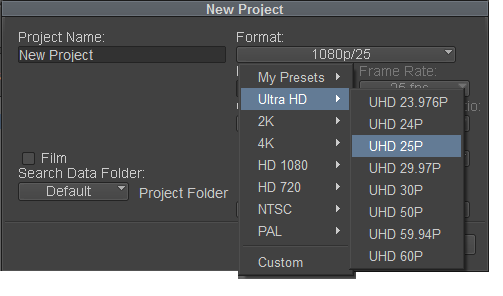 When did UHD become supported in Avid? Avid Media Composer 8.3 started to support UHD and 4K resolutions. However, this first outing was notoriously buggy and I would recommend no less than 8.6.x. I would always recommend that you run the latest version of Media Composer where possible, especially if you are using 4K and 8K content. but this will depend upon your editing systems capabilities (CPU / GFX / RAM and storage performance) The MC 8.3 Whats New Guide gives you a better idea of what could be supported. What codecs can and should I use in a UHD project? For camera rushes over HD resolutions Media Composer can AMA Link - using the right AMA Plugin - to DPX, XAVC-I, RED and QuickTime. It's also worth noting that only ProRes can be imported into Media Composer. That said, working with AMA linked material, especially when there is a lot of it, can be painful and slow. So the best thing to do is to consolidate or transcode it to into MXF Media for the system to work with. UHD images obviously create large video files and these are cleverly compressed during the recording process within the camera. To take this original material and display them while editing requires a lot of computational power and storage throughput. If the source compression is too demanding for the workstation or not supported natively to Consolidate the material then it can be Transcoded into a more editing-friendly format using the DNxHR codec range. These codecs pick up where DNxHD codecs stop, being used for any images over 1920x1080. If you don't have a high-performance system, don't be surprised if you can only get a single stream to playback if you are viewing in full image quality. Drop the quality down to 1/4 in the timeline (yellow-green) to attain better playback and a more responsive timeline, perhaps even 2 streams of video in real-time. What colour space is used in UHD? This is a complex one but let me try and keep it simple. Most cameras such as the SONY FS5 and SONY FS7 will allow you to shoot in a number of colours spaces. For the most of us, Rec.709, which is the same colour space we use in HD images, is still used in UHD material and is widely used in television work. DCI-P3 is the standard for cinema/film material. The most important thing, however, is to understand that if a camera has shot material in a very specific colour space you will need to either have the project set up for that colour space or have the ability to apply a LUT (Look Up Table) to make sure the image is represented in the correct way. If you what a little more detail on what a LUT is, check out this post. The need for a LUT may also be compensated within some high-quality monitors meaning no LUT needs to be applied within the material. This topic alone would need its own post and perhaps we will look at doing this if there is enough interest. Below a screen grab from my Media Composer 8.8.5 workstation showing the number of colour spaces that can be created for your Avid Project. We could do with a few more really eh? Depending upon your needs you may also need to check your IO hardware and external monitor supports UHD and the framerate you want to work at. Check AMA plugins are up to date. Check you have enough editing storage and it is connected via a high-speed interface. Panasonic GH4 can capture UHD at 100Mbs as either MP4 or .MOV files. This means the material will have to be transcoded to a DNxHR format, DNxHR SQ would be the closest in data rates in this case. 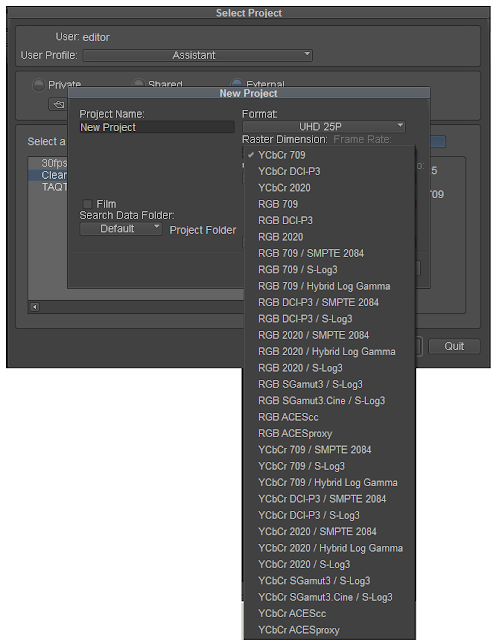 Here are a couple of links to UHD workflow information too. Mission Impossible: Fallout was 'Offlined' in UHD and while this Frame IO post is a general post about the editing process it gives an idea of workflow and the importance of planning for such an undertaking. 4K Workflow Essentials is a great post on Premium Beats by Jonny Elwyn and looks at some of the items we have talked about here in a more generic workflow and a great talk from Larry Jordan. As with anything you do for the first time, it's best if you can test the workflow before you tackle a project in anger.Test with your 4K iPhone footage or DSLR. There is also 4K RED test footage you can download too. Experiment with the project setting and with your drives performance needed for DNxHR codecs.